According to the Transport Ministry, the AES (Automated Enforcement System) has been a huge success and more than 200 additional spots will be added. The Transport Ministry said that the AES, which was not favoured by many quarters has been very successful in reducing accidents in the country. It has increased the levels of compliance among motorists too. 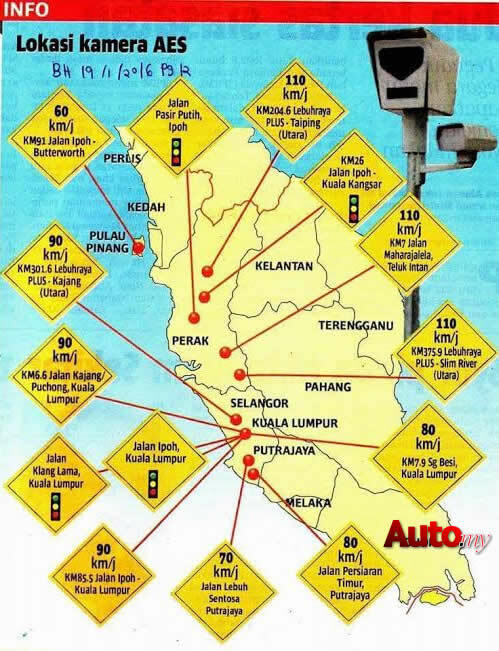 A study by MIROS (Malaysian Institute of Road Safety Research) showed that the pilot run of the AES involving 14 cameras have recorded only 12 cases of fatalities related to traffic accidents. This is 7 cases less than the same locations before the AES was implemented. It is translated to 36.84% reduction of accident fatalities in the 8 months they were operational. The original plan was to place AES at 831 locations after the first 14 but this has now been changed. The AES was not very well received by politicians from both BN and Pakatan Rakyat which saw the project postponed and delayed and has been one of the tightly debated issue for quite a while now. Among them includes placing one along the highway leading toward Hospital Serdang which means that it might not be conducive for vehicles heading to the hospital during emergencies. Another issue that was raised include the awarding of the contract to the companies in handling and implementing of the AES. The report that reducing 7 fatalities as a measure of success has come under fire as well.